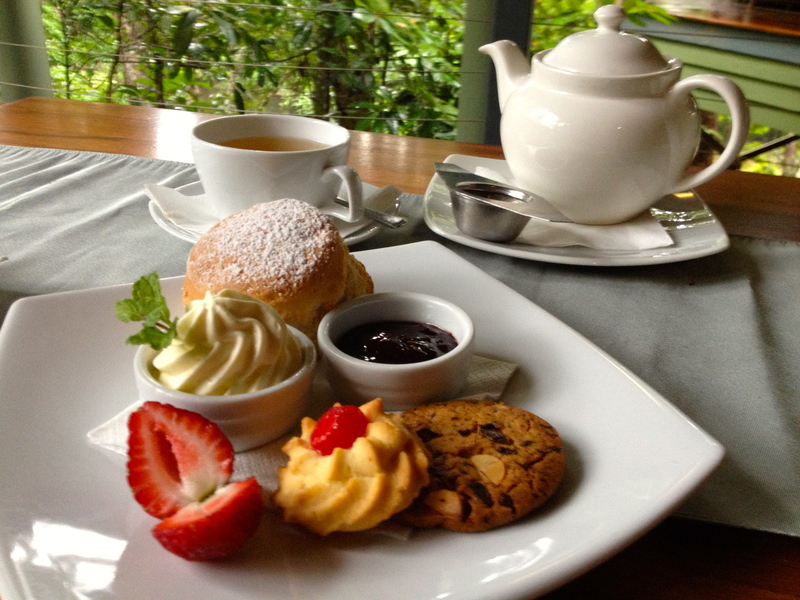 Who has ever heard of having a Devonshire Tea in a tropical rainforest? Well up in the Daintree you can! The Daintree Eco Lodge & Spa specialise in all things native, using as many local indigenous flavours in the menu as possible. The Devonshire Tea spread also has a local Daintree flavour. 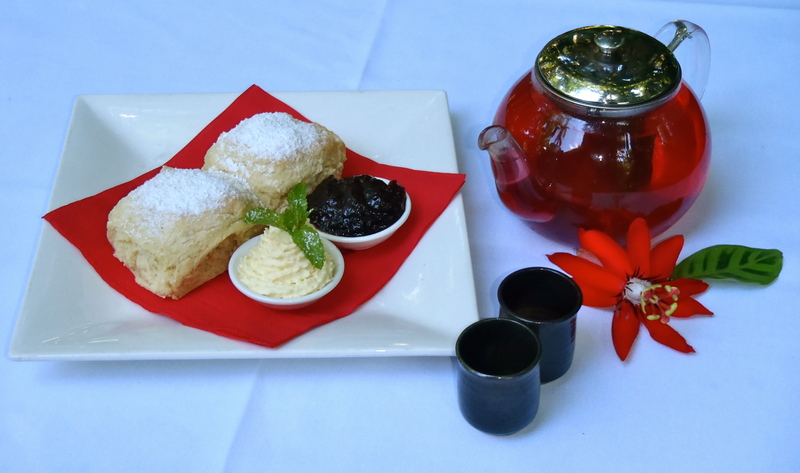 The scones are fresh out of the oven and although the Chantilly cream made with a lemon myrtle twist is part of the signature spread, it’s too light and because of the tropical heat it dissolves before you can get the scone in to your mouth. The wild rosella jam is divine. Sit out on the deck and enjoy the warm air. A recent look at the menu shows that pumpkin and lemon myrtle scones are now served. Tea: A variety, but it’s usually served with the lodge’s signature Binju tea made from a unique blend of native tea, lemon myrtle, lily pilly, Davidson plums. Overall: A Devonshire Tea with a far north indigenous twist. It’s always warm in Australia’s Tropical Far North Queensland. The only variable is the height in humidity and the torrential downpours that drench the place during the wet season. The 60 million year old Daintree Rainforest just north of Port Douglas is astounding in any weather, but I’ve got to say, after a recent stay at Silky Oaks Lodge in Mossman, the wet season is my favourite. The lodge and its treehouses sits on one of the fingers of the Mossman River and is on the very edge of the Daintree National Park. The latter part of my visit coincided with so much rain that the river rose several metres in the matter of a few hours. Rather than tackling a rainforest walk, what better way to enjoy the sound of rain falling onto layers of tropical rainforest than to take afternoon tea on the open deck? The scone is served with a few biscuits and a great sized pot of tea so you can sit for as long as it takes to tire of the ambience. Love the wild strawberry, raspberry and blueberry homemade jam, as it’s more tart than sweet. The scone is crispy on the outside but more bread- like than light and fluffy with a slight unpleasant aftertaste. The freshly whipped cream unbelievably doesn’t disintegrate in the humidity before I have a chance to get stuck in to it and is neither very thick nor too light. Tea: Several types of loose-leaf teas are available including the local Daintree black tea plus teabag varieties. All are served in good-sized pots for a lingering afternoon. Overall: Rain, hail or shine, the Treehouse Restaurant is a wonderful place to be.